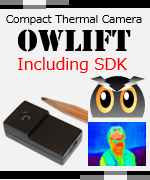 A new feature “Rec/Play the RAW file” was added to the OWLIFTCap Rev.1.5.0.0 that is an app for the compact thermal camera OWLIFT. The RAW file records all temperature data, so you can see temperature information on any pixel and time. 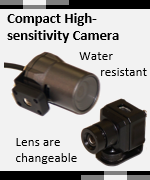 A general thermal camera adds color to images by adopting the AGC(Automatic Gain Control) that allocates a color table led from the highest/lowest temperatures in an image. It improves a visibility of a distribution of temperatures. But a movie might be flickered when the AGC is applied to it, because a temperature assignment is frequently changed when highest or lowest temperatures in each frame are changed. So we improved the visibility by adopting a color table made by highest and lowest temperatures in all recorded time. We named it the Time-based AGC. You can experience it now!! You can experience the beginning demo movie by playing the recorded sample file (64MB). You can play it by using the free app OWLIFTCap. The sample file records RAW temperature data that Japanese pan cake, called Okonomi-yaki, is baked 20 minutes. You can see a dynamic change of the temperature.